Price: $25.00 includes First Class shipping. Bill Felker will sign your almanack per your instructions. 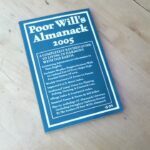 Poor Will’s Almanack for 2012 is the most extensive of Bill Felker’s annual almanacks. 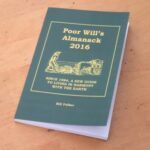 It contains two or more of Bill’s essays for every month, many reader stories, weather guides and a daybook entry for each day of the year. Except for 2012 information on the planets and the moon, this Almanack can be used throughout any year. 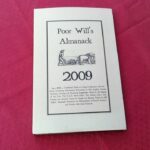 In Poor Will’s Almanack for 2012, I have divided the year into twelve seasons and have noted how they take place in different ways and at different times in the different parts of the country. Although I have kept the basic monthly sequence in the organization of information, I have noted the months during which a specific season might be likely to occur in different regions. These are broad strokes of the phenological pen, but they allow Almanack readers to not only see what is going on in their area but in other areas, as well. A modern calendar measures passage and movement in months, weeks and days, neglecting other gauges like star time, sun time, moon time and weather time. Among those alternate systems, the last one may be the most neglected. the colder months (October through March bringing up to eight waves of high pressure in each month). The warmer months between April and September are more likely to have six or fewer fronts apiece. When all the fronts of the year have passed across your property, the seasons are set to come back again. Of course, the calendar can easily tell you what day it is, but it can’t really let you feel your place in the turning clock of the world. The weather – if you will only count and keep track of its breaths – can! Each monthly chapter of Poor Will’s Almanack lists the dates that the major fronts of the year will cross the Mississippi River in its WEATHER PATTERNS section. All that being said, the monthly section, PEAK ACTIVITY TIMES FOR LIVESTOCK, FISH, GAME & DIETERS, provides a list of pivotal dates for the arrival of high-pressure systems, which can be helpful in planning your outings. Fish, game, livestock and people tend to feed more and are more active as the barometer is falling one to three days before these weather systems. In addition, many people find that fish and game are more active (and dieting is more difficult) when the moon is overhead: at midday when the moon is new, in the afternoon and evening when the moon is in its first quarter, at night when the moon is full and in its third quarter, in the morning when the moon is in its fourth quarter. Second-best lunar times occur when the moon is below your location, 12 hours before or after those times noted above. 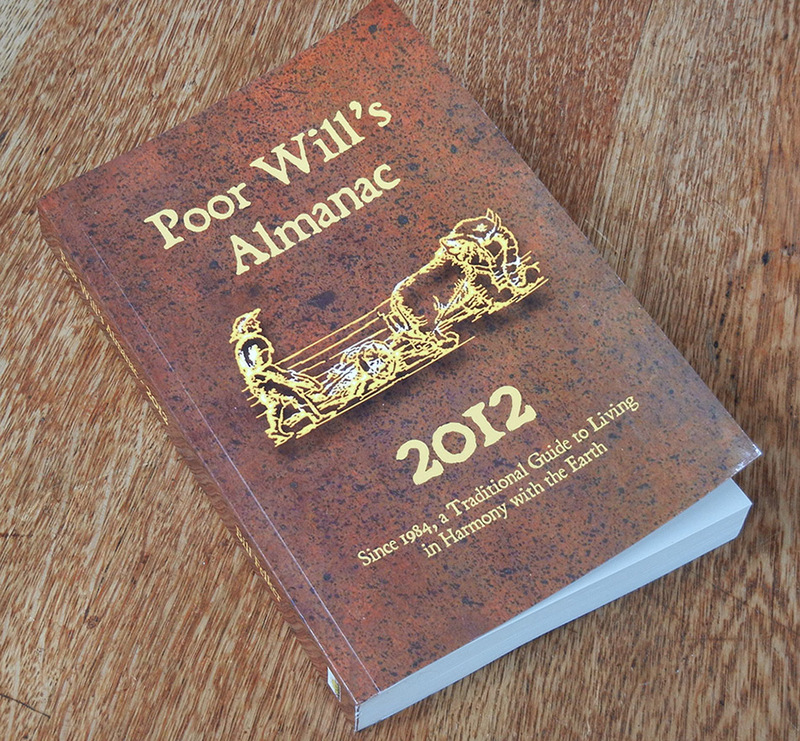 Each DAYBOOK section of Poor Will’s Almanack for 2012 contains notes on the application of lunar lore and weather patterns to farming and gardening. In general, planting crops that bear their fruit above the ground is recommended when the moon is waxing. Plant root crops, flower bulbs, trees and shrubs to promote root growth when the moon is waning. According to a number of studies, the moon exerts less influence on ocean tides and on human and animal behavior when it comes into its 2nd and 4th quarters. Therefore, it might make more sense to perform routine maintenance on your flock or herd near the date on which the moon enters its second or fourth quarter. On the other hand, tidal lunar influences have been proven to be greater at full moon and new moon times. You might expect more trouble with your animals, therefore, on or about new moon and full moon.